Fossilized Biophotonic Nanostructures Reveal the Original Colors of 47-Million-Year-Old Moths. 2011. M.E. McNamara, et al. PLoS Biol 9(11): e1001200. 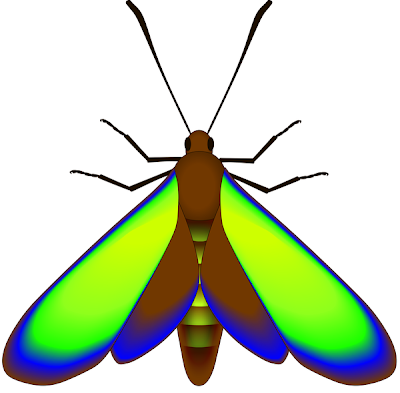 Scientists have now reconstructed the colors in fossil moths that are 47 million years old. This is the first evidence of structurally colored scales in fossil lepidopterans. The fossil moths came from the Messel oil shale in Germany, a site famous for exquisite fossil preservation. Although the original colors of the fossil moths were not preserved, the researchers were able to reconstruct them because the tiny color-producing patterns in the moth scales were intact. The fossil moths owe their color to a stack of layers inside the scales. These layers form a fossil multilayer reflector, which usually produces iridescent colour that changes depending on viewing angle. But other details of the fossil scales suppressed this effect, producing instead muted colors.